A solid hardwood antique sliver wooden French style Rococo Kingsize Bed, complete with slatted frame. Handmade, with elegant hand carved garland detail, and finished in distressed antiqued sliver, with a subtle aged patina applied to the relief. 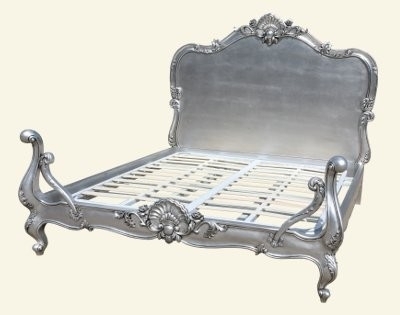 A really stunning piece, this bed oozes elegant french chic. [ Due to the nature of hand made, and hand finished Antique white furniture, minor imperfections are normal ].